The Cow Pond featured in picture #2045 is shown on current O/S maps so I set off to recreate the same view as that enjoyed by Peter Brown and his mother some 90 years ago. However, the pond has long been silted up and is now surrounded by self-propagated trees completely obscuring any view of the farmhouse. The pond was fed by a tiny stream from a similar pond, now filled in, located behind Nostra further up Coos Lane towards Handcross. The outlet has long ago been piped underground to feed Ashfold Lake to the south. 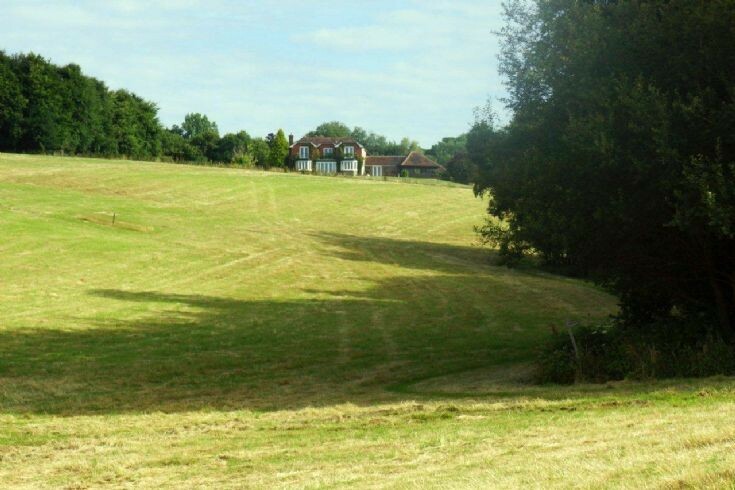 The main photograph shows the farmhouse taken from the field, just a few yards from the former pond. The Large Version shows the location of the Cow Pond, now reduced to a damp patch! Select Open Document to view two photographs. The first shows the edge of the adjacent field with the silted up pond located just behind the trees on the right. The second picture recreates the view of the farmhouse as seen in picture #2045. Perhaps a glimpse of the farmhouse would be possible in the winter!